Large Moravian Star Light - Punched Tin 18" Dia. Availability: Usually ships in 4-6 business days. Our punched tin hanging star lamps are an easy way to update your southwest, rustic or Mexican themed decor. These Moravian style star lights make wonderful outdoor light fixtures for your patio or entry way. 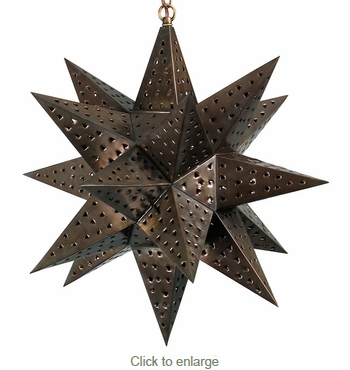 Our star lights are handcrafted in Mexico by talented tinsmiths. Illuminate your own decor or share this beauty with friends and family and give this aged tin Moravian star as a gift. Since each star fixture is hand crafted, color and finish may vary slightly from what's pictured here. Chain and ceiling plates sold separately. $9.95 Small Tin Ceiling Plate 5" Dia. Large Tin Ceiling Plate 6" Dia. $10.45 Large Tin Ridged Ceiling Plate 6" Dia. Small Tin Ridged Ceiling Plate 4.5" Dia. $9.35 Large Tin Ceiling Plate 6" Dia. Giant Aged Tin Star Light with Marbles - 36" Dia.